Working Concepts, Soft Knees, No Strap Knee PadsWorking Concepts, Soft Knees, Knee Pads, Item # 1010, Our customers who are painters, gardeners, plumbers, auto repair personnel floor installers and many others rely on these simple but effective knee pads. SoftKnees are made specifically to go with double-kneed pants or bib overalls. Our customers who are painters, gardeners, plumbers, auto repair personnel floor installers and many others rely on these simple but effective knee pads. The three main clothing lines using SoftKnees are Blakladder, Carhartt and Dickies, who have made the most of their pants by including the double-knee feature, giving workers the choice to insert SoftKnees. These no-strap knee pads were invented with the workmen and their knees in mind. When customers ask for Carhartt knee pads, we know what they mean! Because they are so lightweight, the SoftKnees molded pads are barely noticeable to the worker when standing and walking. SoftKnees fit into double knee work wear by rolling the pad and inserting them into the openings on the pants. SoftKnees are made from closed cell nitrile foam and provide a waterproof moisture barrier and insulation from the cold. They can remain in the garment for laundering on low or medium heat. When the garment wears out, pull the pads out and install SoftKnees in your new garment. 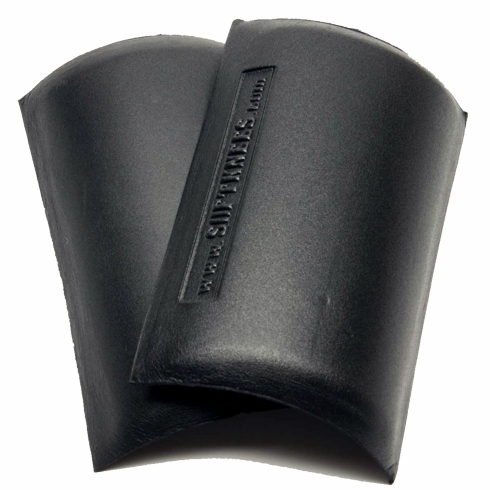 SoftKnee no-strap knee pads are sold by the pair.